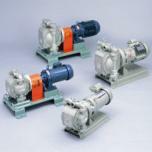 We would like to guide you the "Electric Diaphragm Pump ETD2 Series", as a new product from TAIYO. This "ETD2 Series" is designed at maximum flow up to 120 liter/min, that variation to the "ETD Series" lineup which is used widely at various fields and have received high appraisal from our customers. The cut of running costs and emissions of carbon dioxide to approx. 80% of that of the conventional company products. Contribution to energy saving by reducing running costs for equipment. Enable to use in the clean environment with no exhaust and low-noise. Stable output rate driven by electrical motor. Wide range of flow rate can be adjusted by inverter control mechanism. Add variations of flameproof and increased safety specification to the series. > Select the pump up to 1.5 times the required flow rate. > Please read the instruction manual well, and make sure not to use in the wrong method. > Use the inverter and go with rpm control of the motor for flow adjustment. Do not close the valve and control the flow by the valve at the output piping side. > Use below the max. output pressure and within the working frequency range. If you require using out of the range, please require as special case. * This is the rated current of motor, use within the control range of inverter. * The output flow per cycle is just a value for reference. It may change depend on the viscosity of the fluids.